We're proud to say that many designers in the Brand Assembly community consider sustainability to be paramount within their business. From coast to coast, we've seen examples of how style and sustainability can come together to create unforgettable brands who prove that you don't need to sacrifice one idea for the other. One of these brands is MATE the Label, helmed by Kayti O'Connell Carr and a burgeoning team of women committed to leading the "clean dressing" movement. If you look closely at MATE, it's easy to see why Kayti and her team are best suited for the job. Each collection embodies simplicity which ultimately enables shoppers to build a foundation of what MATE calls "elevated essentials" within their wardrobes. This idea is vital for Kayti, who spoke more about it in our interview while giving us an inside look at MATE's airy, sunlit HQ in DTLA. Trust us when we say it's the epitome of the brand as MATE's signature aesthetic is most present in the studio’s clean interiors with hints of foliage that elevate the otherwise simple but stunning space. Meet Kayti and learn more about her journey as an emerging designer along with her tips for those looking to build a conscious contemporary brand in this day and age. Hi Kayti! Please introduce yourself and tell us about the evolution of MATE the Label. Hi there! I am the Founder and Creative Director of MATE the Label, a Los Angeles based sustainable women's clothing brand. There have been several iterations of the brand since conception. I started the company by selling vintage t-shirts with no intention of creating my own line; however, it was a natural progression. We now offer a full range of vintage-inspired pieces, elevated essentials, and launching sleepwear in the new year. We are laser focused on offering the cleanest and most sustainable product we can. We strictly use natural fabrics like 100% GOTS Certified Organic Cotton, Linen, Hemp, and Tencel. It's important to me to make the connection between the fashion industry and its impact on an individual's health. Brand Assembly is all about creating an ecosystem for emerging designers to be successful and to focus on what they do best: design. With that said, how has being part of the Brand Assembly community contributed to the growth of MATE? When I first started, I was in a traditional multi-line showroom before bringing sales in-house. It was a scary decision to transition but necessary in order to progress our Dress Clean initiative. Before joining Brand Assembly, we rented space in the Cooper Building during market week, which wasn't the best fit for us as we weren't able to have a strong brand presence. 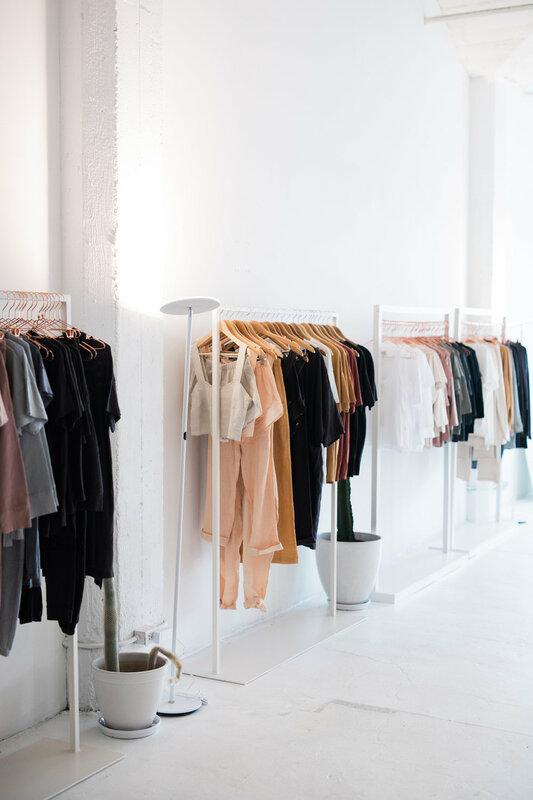 I love how Brand Assembly offers a curated shopping experience and that we are able to cater to our customers in a more personal way. We have seen market week sales increase dramatically. We love the simplicity and refined look of the brand. Would you say minimalism embodies the brand’s aesthetic and values? Why do you think this idea is essential for the contemporary customer? Personally, I am super into clothing (and everything else) to be as minimal as possible with thoughtful details. I am obsessed with eliminating the unnecessary in my life and focusing only on what is essential. If it doesn't give me joy, buh-bye. My design intention is to replicate this mentality and provide pieces that are season-less and that you can wear over and over again. There is nothing more sustainable than loving your garments to death. I think that the contemporary customer is becoming more and more thoughtful about who and how their products are being made, which is inspiring and means we are on the right path. Talk to us about building the brand in Los Angeles. How would you describe the city's fashion scene and what resources does it provide emerging designers? Since I came into this industry with zero experience, I had to fully immerse myself in production and visiting factories every day to learn the process. I had no idea how much goes into making a single t-shirt, I was a total fish out of water and being domestically produced was crucial. I think it's such a different experience being so close to our supply chain and physically connecting with people who make our product than communicating via email overseas. All of our factories are within a 15-mile radius of our HQ, which is a huge benefit and resource to us as a young company. I think that L.A. has so much to offer young brands, but it takes a while to weed out the best partnerships. What would you say are the top traits for emerging designers who are looking to build a successful contemporary brand in 2018? Consistency, building community, and adaptability. How would you describe the company culture at MATE? What are the team values and how are they reflected in the product? We are a small team, but company culture is on my mind more and more and is super important to me. Our office is an open workspace, which I feel supports open communication and collaboration. Since we are quickly growing, it's always all hands on deck, and everyone has to be a team player. As a team, we really value the importance of offering the best product we can, and we want to co-create this company alongside our loyal customers. ALL. OF. IT. Haha. As a growing company, each department continually needs new ways of being supported and adapting to new demands. I find myself having to fully immerse myself in each area as we grow in order to understand what is needed from team members and how to hire for success. What are some words of wisdom you'd like to impart on any emerging fashion professionals who are reading this? Trust your vision and work really really really hard.